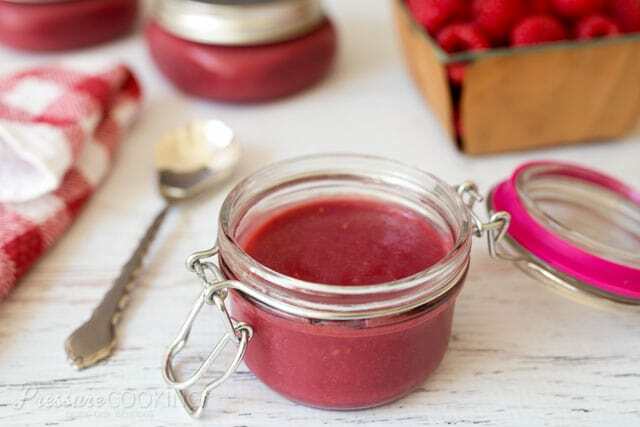 Rich, creamy, tart Pressure Cooker Raspberry Curd is quick and easy to make. A flavorful addition to your favorite dessert, breakfast or even toast. If you’ve never tried lemon curd, you’ve been missing out. My Pressure Cooker Meyer Lemon Cheesecake is one of my most popular recipe, as are my Lemon Bar Cookie Cups. I thought it would be fun to change up the lemon and make a raspberry curd. An Instant Pot is one of the most popular brands of electric pressure cookers. 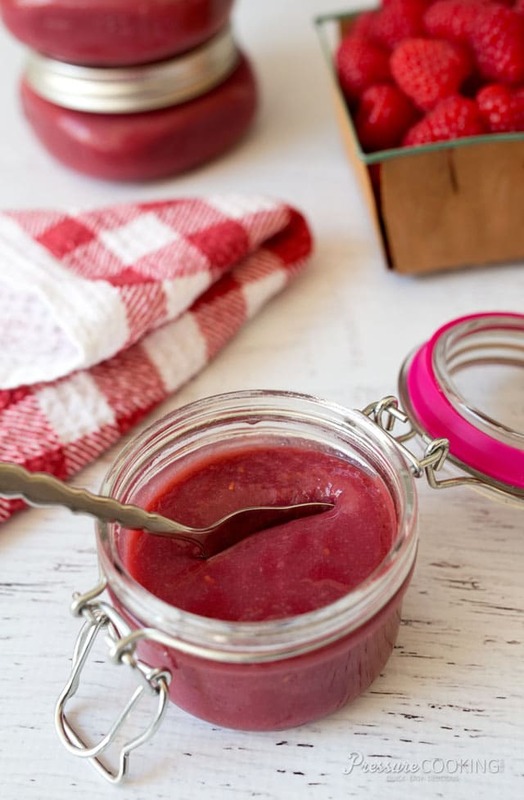 They are easy to use and your Instant Pot can help you create this delicious Raspberry Curd! Cooking the raspberries in the pressure cooker briefly softens the fruit making it easy to separate the juice from the seeds. I used a food mill to remove the seeds, but you could use a fine mesh strainer as well. Using the saute function you can quickly thicken the raspberry curd right in the pot. You could also use Mary A Brecht’s popular technique and cook the curd in jars on a rack in the pot. I swirled my Pressure Cooker Raspberry Curd into mini cheesecakes. (I’ll post that recipe on Barbara Bakes on Monday.) I also spread the raspberry curd on toast, and whole wheat waffles. The recipe makes enough to fill three 8 ounce jars. I put two jars in the freezer to save for more fun desserts another day. Add raspberries, sugar, and lemon juice to pressure cooking pot; stir to combine. Lock the lid in place and select High Pressure and 1 minute cook time. When beep sounds turn off pressure cooker and use a natural pressure release for 5 minutes. After 5 minutes, release any remaining pressure with a quick pressure release. 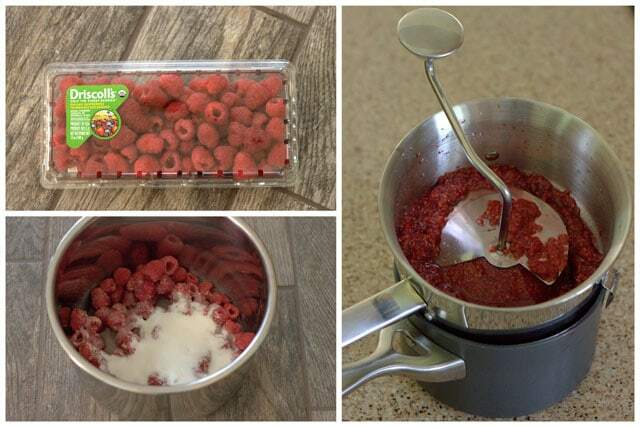 Use a food mill or fine mesh strainer to puree the raspberries and remove the seeds. In a small bowl, whisk egg yolks. Gradually, whisk the hot raspberry puree in to the beaten egg yolks. Add mixture to the pressure cooking pot. Bring to a boil using the sauté function, stirring constantly. Turn off pressure cooker. Stir in butter. Put in a storage container and cool to room temperature. Refrigerate until ready to serve. 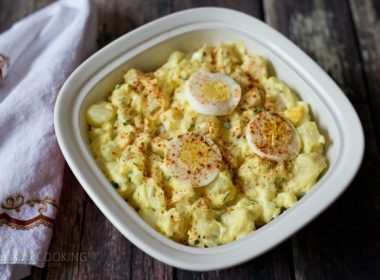 Can I make this without butter? I haven’t tried it, but that shouldn’t be a problem. CAN THIS CURD BE “CANNED” AND PRESERVED FOR USE LATER? With the eggs and butter I would imagine not. Freezingshould work. I love raspberries and would love to try this. Would it be possible to make it with less sugar? 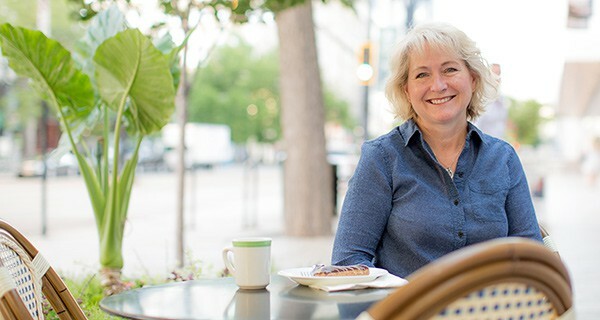 Hi Betsy – yes, you shouldn’t have a problem when reducing the sugar. Thank you for sharing this! I decided to give it a try with what I had on hand, so I used frozen mixed berries. Still amazing! Seedless and smooth (thanks for the mesh strainer tip! Although next time it might be worth breaking out the mill..) I did end up cooking it a little longer and adding a cornstarch slurry because of the extra liquid. But I never would have attempted it at all without your recipe, and I ended up with an incredibly delicious add in for our homemade yogurt. My 9 year old son said it’s better than any store-bought yogurt, and my husband is thrilled too. Cooking it longer on the sauté function, not pressure. Thanks again!! Thanks Traci! That does sound like a delicious treat. Excellent, unlimited uses for this!! I did leave the seeds in and run the berries through the blender before cooking as someone else had suggested and it worked great! I could see this being used on homemade yogurt, ice cream, cheese cake, etc! Will be sure to keep this recipe and use again. I have done lemon curd successfully in the iPot. I Adore raspberries and couldn’t wait to try this. I did exactly as written but It it came out really really thin. I ended up doing the cornstarch thing. I’m wondering if I cooked it a couple of minutes longer? Any suggestions. It still tastes wonderful and I pour a little over homemade vanilla yogurt. Hi Patsy – thanks for taking the time to comment. Quick thinking using a cornstarch slurry to thicken it. It does thicken as it cools, but if it was really really thin, it probably wouldn’t have thickened enough. You may have just needed to cook it a little longer, or perhaps your raspberries were much more juicy than mine. I’ll have to make it again and measure the raspberry juice I use. It does sound wonderful over homemade yogurt. I never knew! I make lots of lemon curd but I’ll have to try this next summer when I have more rasoberries on my canes than I know what to do with them. I usually end up freezing them. Sounds like a delicious problem to have. Thanks Bonnie! Hi Barbara – This sounds so yummy… I have two questions. 1. I have an electric pressure cooker with one setting, no high or low, do I still cook for one minute? 2. Could I use blackberries? Or a mix of raspberries and blackberries? Thank you! Hi Tina – if you only have one setting, then the default will be high pressure and you won’t need to change the cook time. I think it would work well with blackberries or a mix too. Enjoy! Barbara, how would that be if you left the seeds in and didn’t strain. I’m kind of on the fence about it. I wondered about not de-seeding this too. I don’t mind the seeds. Maybe Barbara missed this question – I see she’s answered others. I did miss this question. Don’t know how – sorry. If you don’t mind the seeds, you could certainly give it a try. I always buy seedless raspberry jam because I don’t like the seeds. If you give it a try, let me know how you like it. I don’t know if this would work here, but when my sister and I make raspberry butter, we first throw the berries into a high power blender for a couple minutes and it really breaks down all the seeds. The raspberry curd sounds so good. 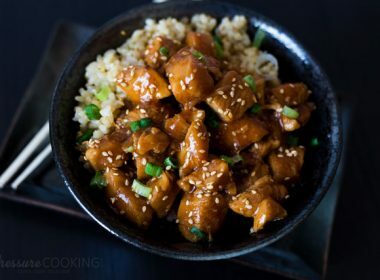 How do I make this on the new but non-electric Presto pressure cooker? I am 87 and have used pressure cookers for many years. 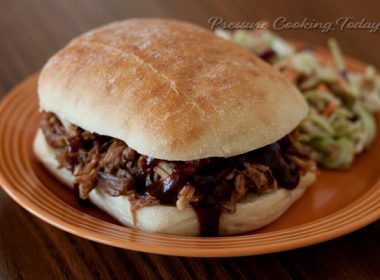 I would like to have directions to convert pressure cooker rec[pes to my style of cooker. Your recipes look so good. 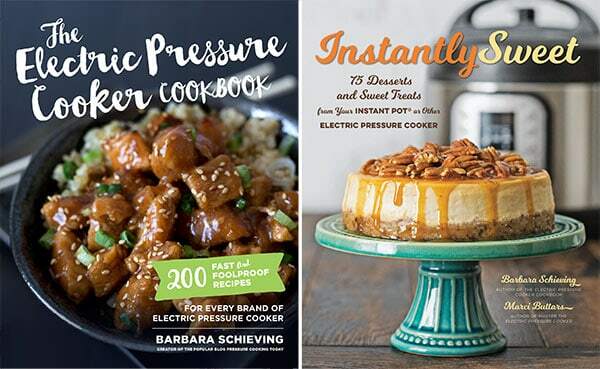 Hi Barbara – nice to meet another Barbara who pressure cooks. 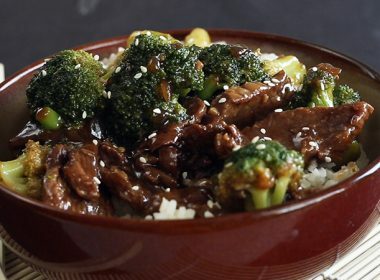 You shouldn’t need to make any changes to the recipe for a stove top pressure cooker. Just bring it to pressure like you normally would on the stove top and then reduce your stove temperature to maintain high pressure for 1 minute. 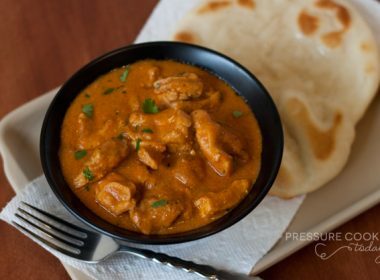 After 1 minute remove the pressure cooker from the heat and follow the recipe as directed. How well would this work with thawed frozen raspberries? Hi Susan – I haven’t tried it, but I think it would work great. Too funny – another Susan here who was going to ask the same question. I have about 10 lbs of frozen raspberries from our garden and can’t wait to try this out. I figured it would work with frozen fruit too. I’ll let you know how it turns out. Hey Susan…I was just wondering if you tried using frozen fruit to make this curd and if it turned out? Did you make any changes. Add homemade fruit curds to something I’ve never made….and ever eaten. I’ve been meaning to make your lemon curd and somehow haven’t gotten there yet. I adore raspberries so I know I’d love this. I love my food mill too-I’d be lost without it. That looks absolutely delicious, Barbara-and easy too! Sure wish my Godparents still lived in NH-they had a HUGE patch of raspberry bushes-I could have picked enough for a batch of this in 5 minutes. Those were the days…..